No longer will SQL Server administrators have to worry about filling up their database servers. SQL Server's next edition will provide a way to extend databases into the cloud, allowing customers to retain information they otherwise might need to erase due to a lack of local storage space. SQL Server 2016, a preview of which will be released around the middle of the year, will also encrypt all data by default, and has been integrated with the R statistical programming language, said T.K. Ranga Rengarajan, a Microsoft corporate vice president who leads engineering for the company's database and big data businesses. Microsoft provided a glimpse into this next major release of its flagship database system at the Ignite conference for IT professionals, being held this week in Chicago. The idea with the stretch feature, as Microsoft calls it, is to extend a database table onto the Azure cloud, so the user won't have to worry about buying extra storage space, shredding the database into multiple partitions, or permanently erasing old or little used data. 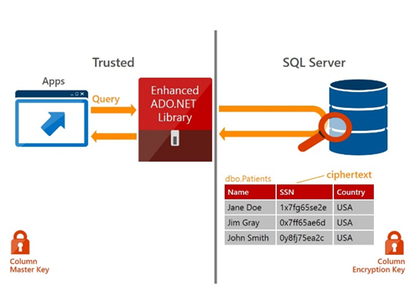 In addition to the stretch feature, Microsoft is equipping SQL Server with several other major new features as well. The updated server encrypts all the database's data, both at rest and in transit. Malicious attackers will have no reason to break into the database, because the encrypted data will appear as gibberish without the encryption key, according to Microsoft. Software to encrypt databases has been around for a while, but what makes Microsoft's approach different is that it is the client application, not the database itself, that encrypts and decrypts the information, Rengarajan said. As a result, query responses are also encrypted, so valuable information can't be eavesdropped on en route. "We're able to do the data processing in cipher text," Rengarajan said. The additional time for encrypting and decrypting data should be minimal and not noticeable, he promised. Encryption key management can be done through the system's existing authentication system. Microsoft has not decided on pricing for storing data in the cloud, but the company will keep it low enough to be less expensive than setting up a full backup service, Rengarajan said. SQL Server is also being beefed up to handle in-depth data analysis, which is increasingly becoming part of the customer workload, he said. Users will now be able to mix transaction processing and analysis jobs. Historically, data analysis, especially very large jobs, were conducted on separate data warehouse systems, because the volume of work would slow the performance of the transactions currently being executed on the database. With SQL Server 2016, Microsoft has figured out a way to run analysis on a table in such a way that it does not impact the transactional performance. This feature could eliminate the need for running separate data analysis systems, as well as ensure that even the most current data is included in the analysis. Microsoft is also incorporating the R programming language into SQL Server. R has been an increasingly popular language for doing statistical analysis for tasks such as identifying trends and predicting future performance. Earlier this year, Microsoft acquired commercial R distributor Revolution Analytics. The company has planted Revolution Analytics' processing engine in SQL Server, allowing the system to query data using R, in addition to using SQL. People interested in testing the beta version when it becomes available can sign up here.